We want to use this opportunity to remind students about some important settings on your iPad and how we would like you to have them configured. We also want to explain a change to the QuickOffice App and how that affects your use of this tool. Students should be using iCloud to back up their data. To verify this or make changes, go to the Settings option and tap on iCloud. 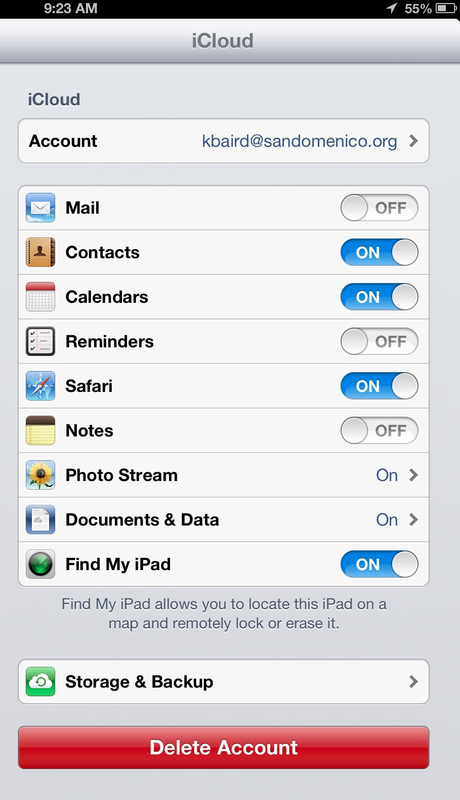 Please make sure they have these iCloud settings turned on: Contacts, Calendars, Safari, Documents & Data, and Find My iPad. Photo Stream, and Notes are optional. Photo Stream tends to take up a large portion of your iCloud storage so please be aware of the amount of data you are backing up there. If students save information in Notes, then iCloud back up should be turned on for Notes. iCloud back up of Notes does require an iCloud E-mail address. Please know that this account is not part of the San Domenico School domain and would not be controlled by the restrictions we place on our San Domenico School E-mail system. 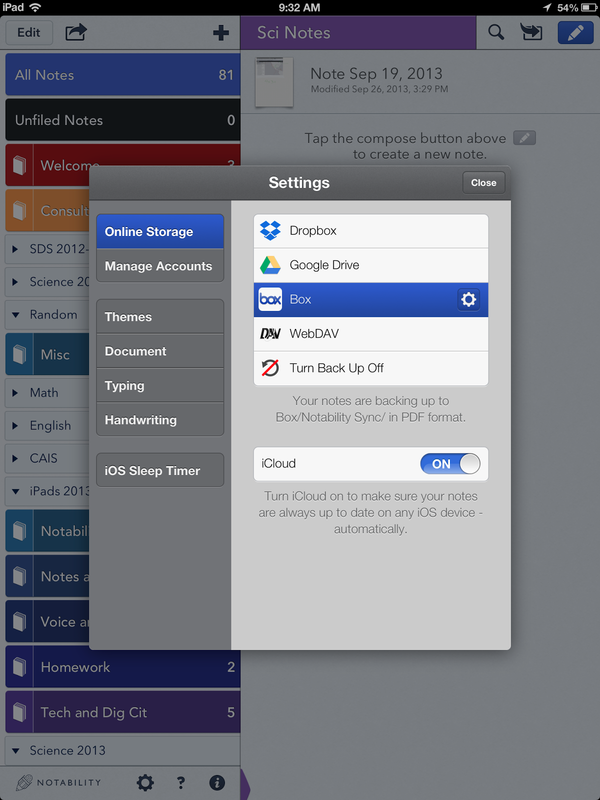 Notability is another app students can automatically backup to their BOX or GOOGLE DRIVE accounts. To set this backup option open the Notability App. From the main page tap on the gear icon in the lower left corner. Then select "Online Storage." From here students can select either BOX or GOOGLE DRIVE. Notability will automatically create a folder and save all of your Notes in the Portable Document Format (pdf). Note: iCloud may be turned on here as well - some students have restrictions and may not have the iCloud option available which is OK since they are now backing up to BOX or GOOGLE DRIVE. Finally, the Quick Office App is used by some middle school students at San Domenico School to create documents, spreadsheets, and presentations. Recent changes in the Quick Office App require us to make some changes in how we use the software. Basically, we will be removing the current version of this App and replace it with the new version. However, those students who are currently using their Quick Office App and have files stored on their iPad will need to move them to Box or Google Drive before removing this App. 6th grade students should just delete the app as they have not used it this year. 7th and 8th grade students must move any items saved onto the iPad via the App into either BOX or DRIVE. 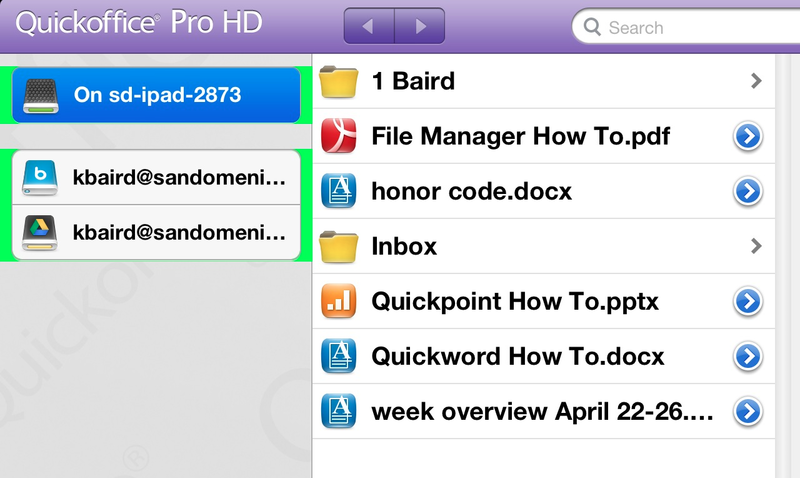 To save and move these items select your iPad in the left column of the main Quick Office window. Then drag and drop your files to either BOX or DRIVE options on the left. Once you have completed the process to move all your files to one of your cloud storage areas please delete the app and install the new version from self-service. Once you have the new App installed you have access to Google Drive, ONLY. However, you can still create docs, spreadsheets and presentations. If you would like assistance with this process or need help as you walk through it, please contact the Technology Team at techsupport@sandomenico.org.